Configure repository design and access controls to manage access to sensitive content. Restrict access to folders, documents, fields, annotations and other granular document properties. Inherit active directory groups for easy security maintenance. Control exactly who can view content with individual document security tags. 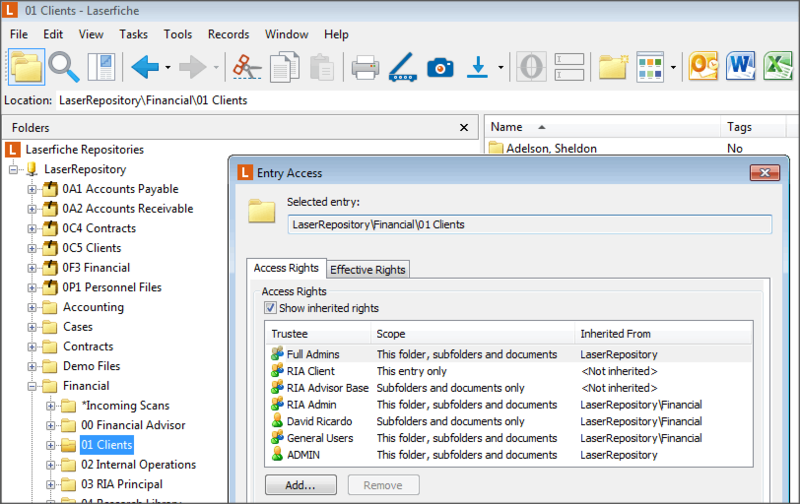 Use security filters to vary access rights within folders without needing to configure security settings for each individual document. Configure who can create document templates, create links between documents and apply stamps and other notations. Ensure records integrity with precise document control. Protect sensitive metadata by controlling information access down to individual folders, templates and fields. Send alerts when specified documents are printed or exported. Automatically apply watermarks to control printed and exported copies of documents. Prevent users from accessing system information stored on Oracle and SQL servers with database security settings. Encrypt data up up to AES-256 and use SSL/TLS encryption between applications. Securely publish to the web with built-in IIS access security and firewall configurations. Choose between whiteout and blackout redactions to secure confidential information. Ensure that redacted text remains secure in search results. Black out text upon document import and export. Ensure redaction persists upon printing and export. Auto-classify, apply disposition schedules and other regulatory retention rules using metadata and other information on incoming records. Automatically create record folders and move documents into the appropriate locations. Set up notifications for document destruction. Enforce records management policies across all devices. Generate reports to identify and locate records that are ready for disposition. Ensure long-term data preservation with a standard format that meets the Victorian Electronic Record Strategy (VERS) requirements. Automatically apply digital signatures to authenticate document approval. 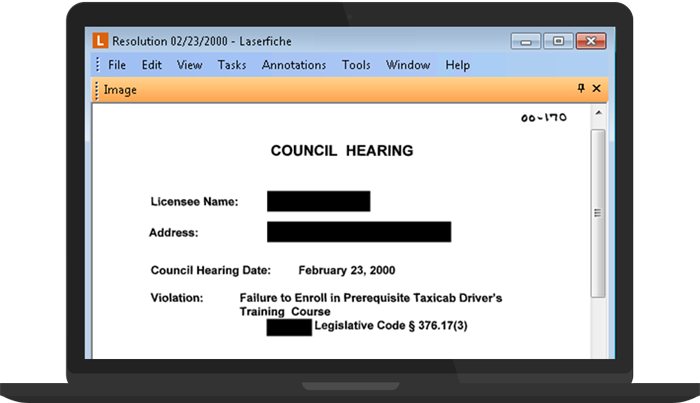 Automatically detect if changes are made to files outside of the Laserfiche environment. Notify users if documents contain data loss or corruption using volume checksums. 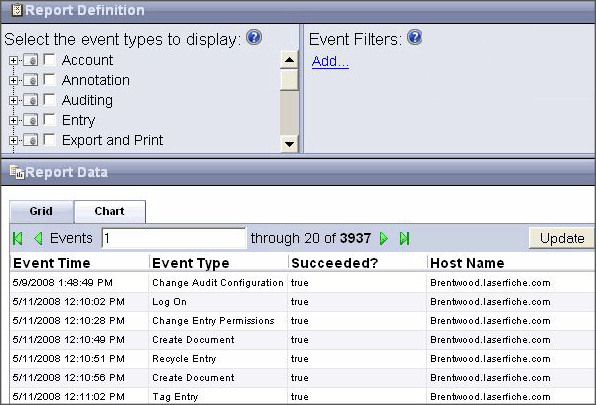 Track system use to form a complete record of organization-wide activity. Monitor system login/out, document creation/destruction, password changes and more. Log user actions taken on smartphones and tablets. Generate web-based audit reports that outline the time, user and changes associated with all system modifications. Track all changes made to security settings at the user, document and system level.